Can We Identify a True Self by Appearance? In a culture where good looks are like a get-out-of-jail free card, it is natural to wonder how letting go will impact our body. Lester Levinson, an American who reached the state of freedom, said that people who once looked beautiful suddenly looked plastic and ugly ducklings became beautiful swans. More and more, I have glimpses of what he was saying. About twenty years ago, I was doing research in the library at the Association for Research and Enlightenment (Edgar Cayce’s Organization), which is said to be the second largest metaphysical library in the world, after the Vatican. Edgar Cayce was called the sleeping prophet. He could place himself into a hypnotic state and answer questions. 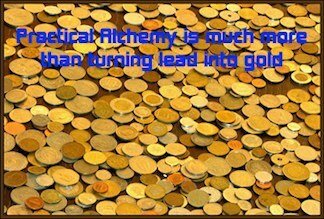 He did over 14,000 readings. I became very interested in Cayce’s work since he did many readings on ancient Egypt providing useful clues for my initiation research. Often, while flipping through his readings, I would uncover little Cayce tidbits that inspired me to dig deeper into my own mind. This was one of them. Cayce had a study group that he was very close to. At one point, he gave a reading that the group found so beautiful that their eyes teared, their minds went silent, and they experienced what Cayce called attunement. In the language of initiation, their True Self was revealed. When that happened, Cayce said he saw who they really were, and the difference was so great that he had to go collect himself. Obviously, his false self came back into control; his True Self wouldn’t have felt the need for collection. Shortly after reading this, I was trying to deal with a client who was very angry with my programmer. While I knew the problem wasn’t serious and could easily be fixed, the client didn’t see it that way. I brought my programmer and my trainer on this particular job into my office, and we called the client. Now I must tell you something about George, my programmer. He was a super nerd. His clothes didn’t match, he had gigantic glasses, and he only showed signs of emotion when he talked about his toy soldier collection. I dialed the phone and held my breath ready to be attacked. As the client said, “Hello,” George raised his hand toward me and whispered, “Cathy, I’ve got this handled.” As George masterfully alleviated the client’s concern and turned him from a raging bull into a puppy dog, I watched my eyes do something crazy. I saw George’s True Self, and he was outrageously handsome. He completely morphed before my eyes. As the call ended, George went back to super nerd. I never told him what I saw. But I now understood why we are so drawn to beauty. Before the illusion was masterminded, beauty meant that you were pure and could be trusted. But then the illusion introduced the notion that beauty on the inside meant ugly on the outside and vice versa. Now we can’t tell a book by its cover, and we are often tricked by false beauty. I’ve learned a lot about the True Self since that time in my life. It never goes away; it just gets covered up with the false self (a huge complex of beliefs and memories). So the potential to return to true beauty is as great as our potential to return to our True Self. Once we accept beliefs, we begin to see proof of them. Eventually, we relabel our beliefs as the truth, and the false self takes charge. The false self views life as unsafe and beyond our control, so it creates an army to fight off the enemy or a camouflage of good to protect its body. In order to free our True Self and its body temple, we have to eliminate the army or the camouflage. But we aren’t going to do this if we can’t let go of our beliefs. We fear that we’ll die if we don’t have our protection. We don’t realize that our beliefs project out our enemies; so our persona is only fighting our own false self. Our false mind tells us that we have nothing to gain by letting go and everything to lose. Most people believe the false mind; and work toward perfection of their persona. Some personas are almost perfect clones of the True Self. We can only tell the difference because the True Self has no enemies to battle. 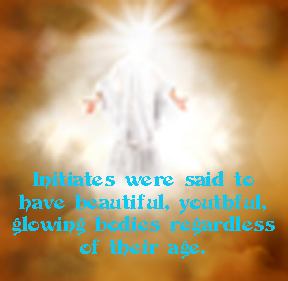 The ancient initiates were described as beautiful and eternally youthful people. But it was not because they had great personas, good genes, fine plastic surgeons, or an incredible workout routine. It was because they were completely pure in mind. They didn’t have any beliefs so they didn’t need a persona. Can We Return to the True Self Body? Cayce told his group that it was possible, but unlikely, to perfect their bodies in this lifetime. However, he provided another clue that supported the body as a Temple theory. He said that spirit is our life force, mind builds on that life force, and the physical is merely the effect. This matches what the initiates taught. First, they avoided fixing effects. Second, they let go of the beliefs in their mind. They didn’t just let go of some of them; they let go of all of them. Then they let their spirit shine through. This is why people painted the initiates with a glow around their body and head and called them Gods. 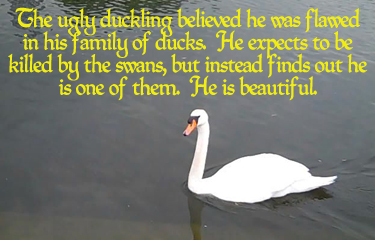 My favorite story as a child was the ugly ducking; I hoped it was true and that one day I’d be a swan. I didn’t understand the story back then, but I loved it. And as my journey has progressed, I understand why. For a related post about transformation, click here.